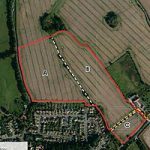 RBCs planning committee voted unanimously last night to send strong objections to South Oxfordshire on the speculative application from Gladman to build 245 houses on open countryside immediately adjacent to Emmer Green. 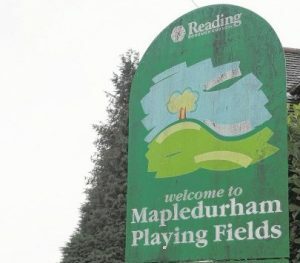 All of the public speakers and councillors spoke in very robust terms against the application which GLOBE believes to be unsustainable, contrary to the approve SODC local plan and objectionable on many other grounds including ecology and the burden on local services and the road network in Reading. South Oxfordshire will decide the application at a planning meeting in March and we urge GLOBE supporters who have not yet expressed their concerns to send objections to SODC. The Heights school is currently in a temporary site next to Westfield Recreation fields in Caversham. Mapledurham playing fields came out first with 70% of survey participants saying they would support it as the new school location. 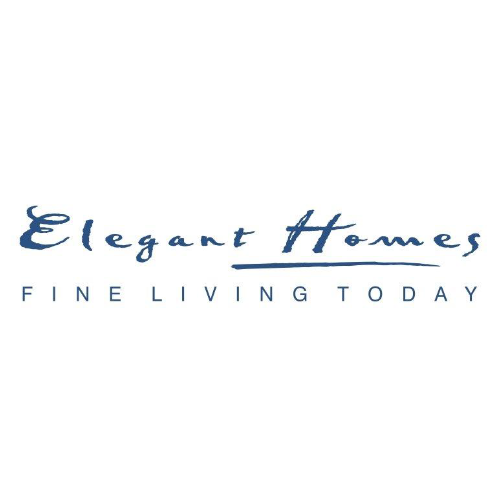 The results have been passed onto EFA for a decision. Apart from the fact that there is clearly a need for more school places, it is a pity for green space to be sacrificed. The Reading Chronicle has published an article here. The full stats from the survey can be seen on RBC site here. Caversham commuters are seeing increased travel times as they find that can’t drive over the Reading bridge due to strengthening works. 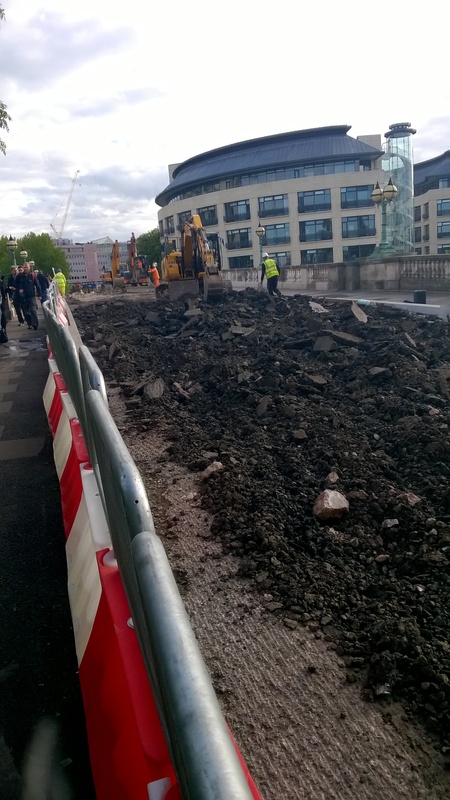 The reading bridge is closed for two weeks from Monday, 18th May 2015. Reading Bridge may be closed to Cars/Trucks. But pedestrians can still use it! So if you are going into reading or close by, why not ditch the car for the two weeks and save some time! Plus, it will save you sitting in the traffic jams, while also saving fuel costs and giving you some nice health benefits. PS: If you want to see updates on the Reading bridge strengthening progress, get reading have a page up here. 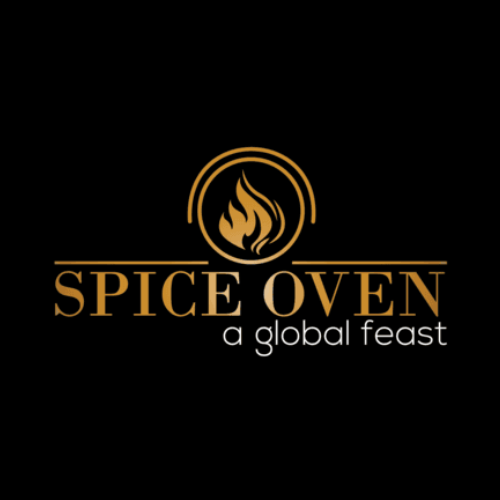 With the help of the Bina restaurant, the Caversham Traders Association donated £1,200.00 towards Caversham GLOBE. This has been possible due to the success of the Caversham Rewards card where part of the money goes back into the community. 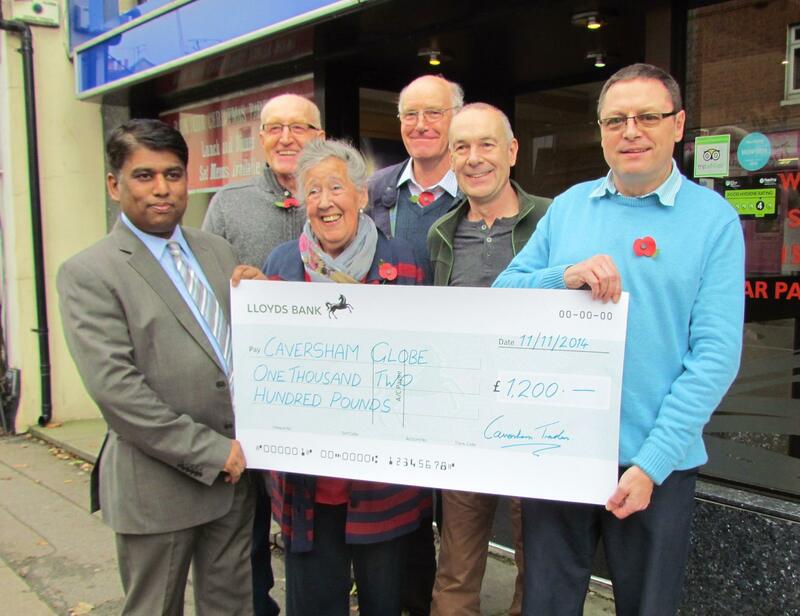 Caversham Traders association present a huge cheque to Caversham GLOBE. 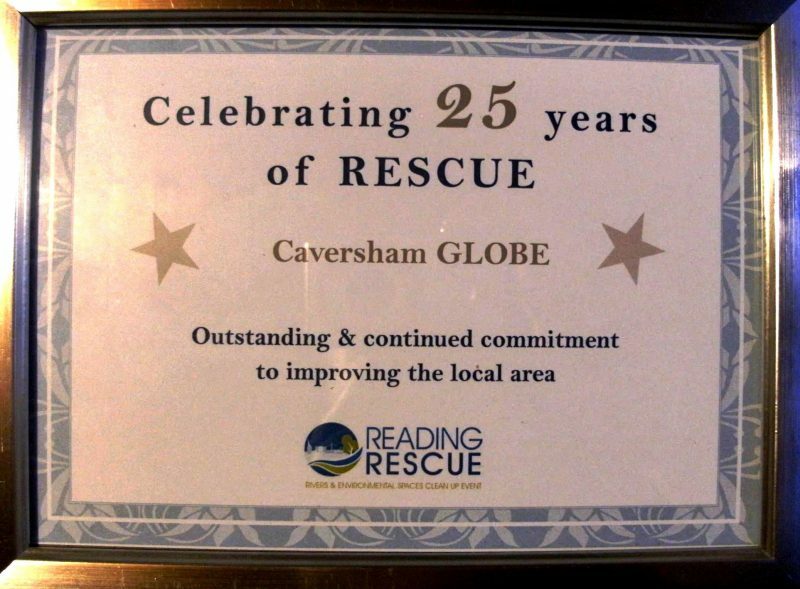 Caversham GLOBE were very pleased to receive this award at RESCUE event celebrating 25 years of Reading RESCUE (Rivers and Environmental Spaces Cleanup Event). RESCUE was started in 1989 by a group of committed and concerned canal users from West Berkshire and Reading, the Rivers & Environmental Spaces Clean Up Event has changed tremendously over the years. It has grown to include business sponsorship and urban areas. 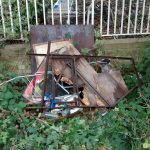 Several items of flytipping and old metal road signs dredged out of the Thames at Reading Bridge by Caversham GLOBE supporters this weekend. Our contribution to the October Reading RESCUE event which took place across the town from 9-11 October. 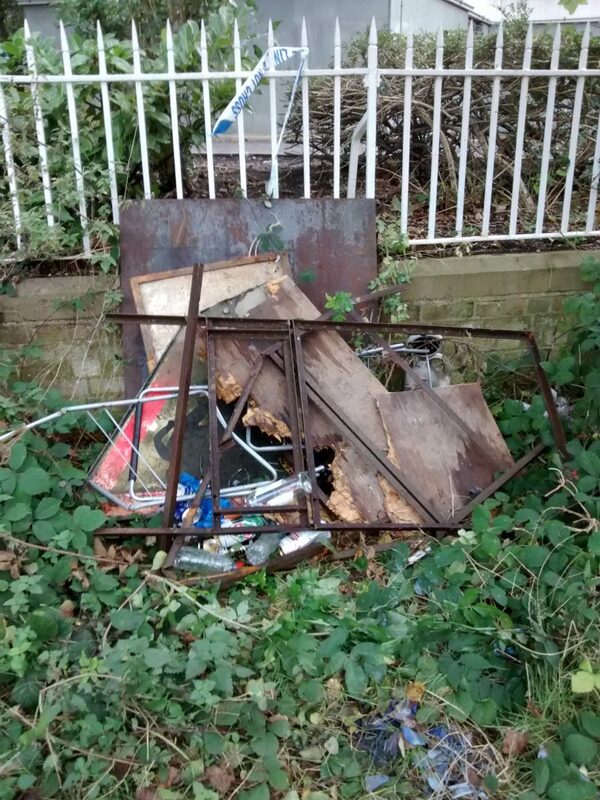 An old shopping trolley was also pulled from the river at King’s Meadow. 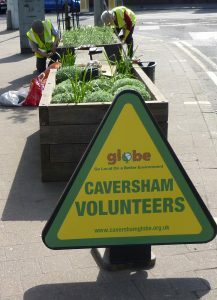 In April 2011 Reading Borough Council (RBC) told Caversham GLOBE that, due to budget cuts, the Council would no longer be maintaining the 22 planting boxes along Church Street Caversham. These planters had been installed by RBC in 2001 as a millenium project to improve the appearance of Caversham village centre. In 2012, Caversham GLOBE agreed to look after the 10 RBC planters on the BT Telephone Exchange frontage. The following year, encouraged by the Caversham Traders Association (CTA), GLOBE extended its work to include the 12 RBC planters on the north side of Church Street. 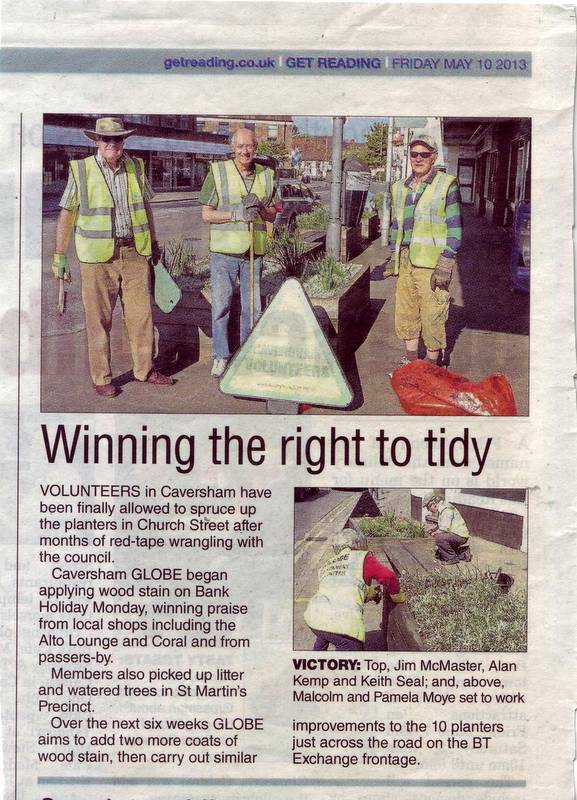 This is how it was reported in the local paper “Get Reading” in May 2013 when the planters were all woodstained, selectively pruned and partially replanted. Thanks were due to the Caversham Traders Association, Drews Hardware for materials and RBC for a small grant. 10 Caversham GLOBE activists gave up much of their Bank Holiday time to carry out the first stage of painting and replanting. Then six volunteers from Scottish & Southern Energy Vastern Road Offices, as part of their “Community Programme”, later assisted in concluding these improvements for Spring 2013. Five of the Caversham traders made the generous gesture of paying the costs of buying new plants. GLOBE subsequently watered and replanted, with the help of Green Shoots Garden Centre (part of the Ways and Means Trust Charity). The wonderful volunteers hard at work planting! The end result – GLOBE still maintain these plants to this day. In June 2014, as result of the installation of Bicycle Hire stands, some of the planters on the BT Exchange forecourt have been replaced and we await replanting by Reading Borough Council. 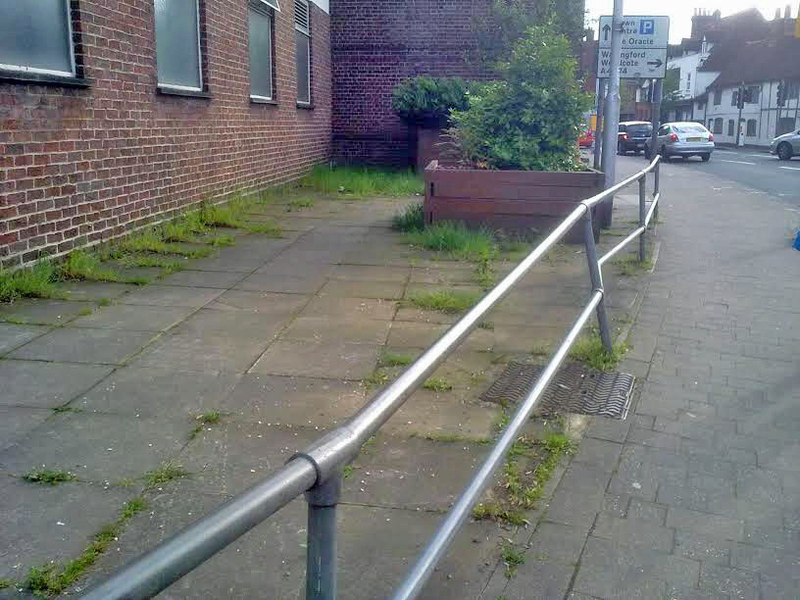 In the meantime,GLOBE has been encouraging BT Facilities Management to implement a maintenance programme for a tidy frontage and removal of the remaining redundant railings. This eyesore should soon be just a bad memory! This eyesore should soon be just a bad memory! Caversham GLOBE’s Annual Report for the calendar year 2013 has now been published following approval at our AGM on 24 June 2014. It shows the huge range of local environmental issues and activities that Caversham GLOBE supporters have been involved in. The report can be found on the Downloads – Reports page. 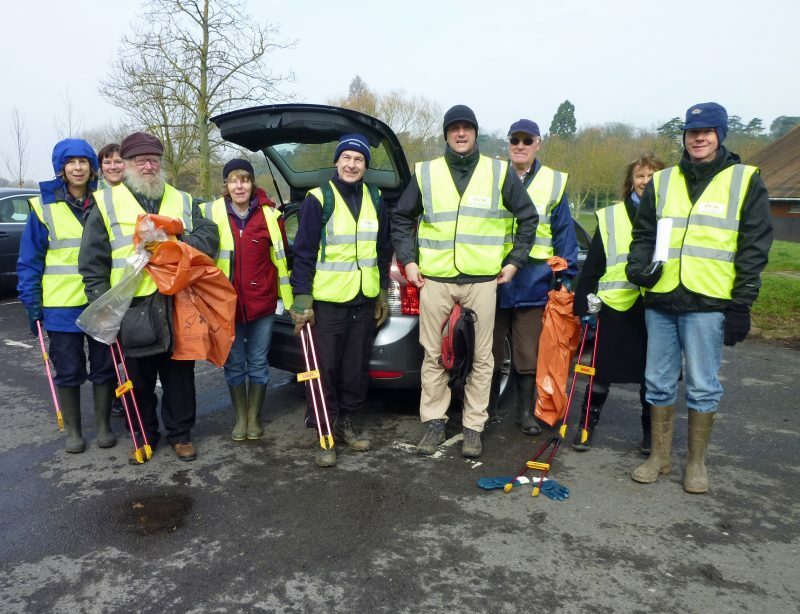 RESCUE 2014 – Help clean up litter hotspots around Caversham! Reading RESCUE 2014 [Rivers and Environmental Spaces Clean-Up Event]. Caversham GLOBE has organised the following events for RESCUE 2014. All help is welcome. Please arrive in good time to familiarise yourself with the safety notes and sign our attendance sheet as required for public liability insurance purposes. NOTE. It’s important that participants wear the right clothing and footwear due to ground conditions, working near brambles/undergrowth and weather. Friday 14 March – Beech Wood off Badgers Rise, end of Hemdean Road 10 am. Meet by junction of Badgers Rise and Hemdean Road. All help is welcome, so please come along. 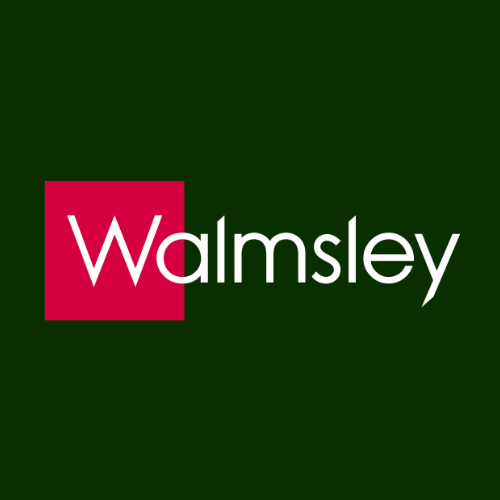 If needed, you can contact Richard Denney via [email protected] or on 07768 958407. Friday 14 March – Christchurch Meadow/George Street area from 2 pm. Meet at the corner of George Street and Gosbrook Road by the entrance to Christchurch Meadow next to the advertising posters. All help is welcome, so please come along. If needed, you can contact Richard Denney via[email protected] or on 07768 958407. 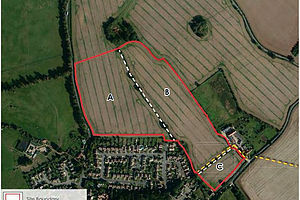 Saturday 15 March – Far end of The Warren by start of Bridle Path from 10.30 am. 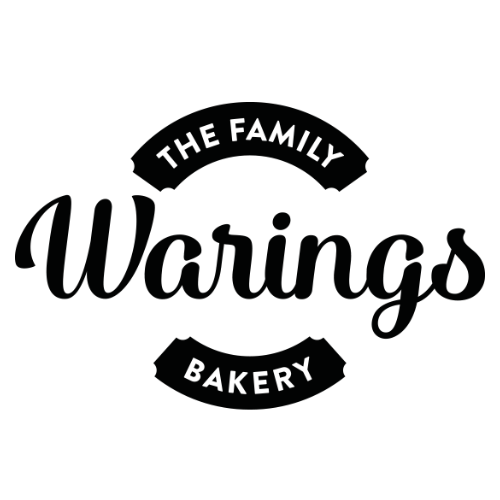 Meet at far end of The Warren by 10.30 am. All help is welcome, so please come along. If needed, you can contact Richard Denney via [email protected] or on 07768 958407. Sunday 16 March – 10.30 am Meet at corner of Rectory Road and Hemdean Road by 10.30 am. All help is welcome, so please come along. If needed, you can contact Dave Kenny via [email protected] or on 07906 630378. Plan is to clear some areas of Caversham centre. Sunday 16 March – Hill’s Meadow and View Island from 2 pm PROMPT. Meet by the “Thames 21” Van in the gravel area near the skate park on Hill’s Meadow by 2 pm. If needed, you can contact Dave Kenny via [email protected] or on 07906 630378.